US State Department spokeswoman Jen Psaki put her foot in it last week, as she was caught on a hot mic in a press conference apparently calling her statements about Egypt "ridiculous." When asked about the recent acquittal of former Egyptian President Hosni Mubarak, a decision which has led to massive and lethal protests after charges against him of killing 239 protesters during his ouster in 2011 were dismissed, Psaki gave a particularly quizzical response. "Generally, we continue to believe that upholding impartial standards of accountability will advance the political consensus on which Egypt’s long-term stability and economic growth depends. But beyond that, I would refer you to the Egyptian government," said Psaki. Associated Press's Matt Lee responded by voicing his bafflement, saying her answer "means nothing," and adding "it’s like saying, 'well, we support the right of people to breathe.' 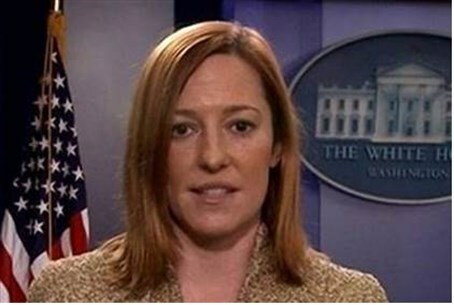 That’s great, but if you can’t breathe..."
Psaki avoided elaborating and quickly wrapped up the conference. After the lights dimmed and the room started to clear, she was caught on the still active mic saying to Lee "that Egypt line was ridiculous," at which he laughed.